Joe Wells, of whom it has been said. : TOM'S DAD. My latest children's book available on Amazon. 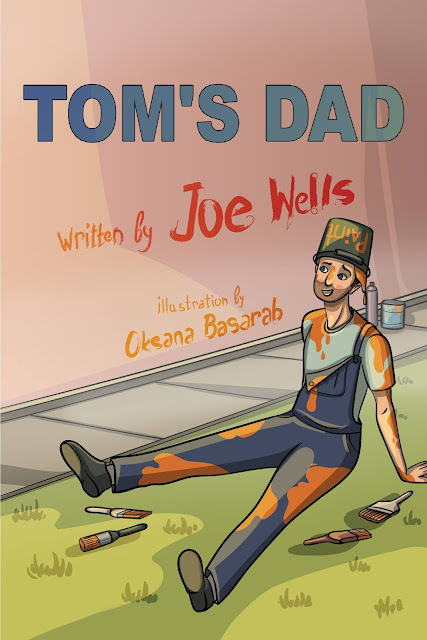 Another delightful children's book by Joe Wells telling the story of the rather accident prone Tom's dad, his exploits when trying to paint the house, to driving his car into the duck pond and an unfortunate episode when attempting to bell ring at the local church. Tom's dad continues with losing his shorts at the school father's running race and later being dragged by dogs when he helps with the dog walking. He suffers more accidents until he finally succeeds when he attacks an old tree with a chainsaw and produces a rather wonderful carving making his son very proud of him. This book is entertaining for children of 5 to 8 years of age, with wonderful illustrations for the children and a few jokes for the adults who may be reading to them.